7 x 7 x 3"
Next Working Day Delivery for all orders placed by 4 pm. Orders under £100.00 have a £8.34 (inc vat) £6.95 (ex vat) delivery charge. Orders over £100.00 will be free delivery. If you need a Saturday Morning delivery there is a £15.95 carriage charge (must be ordered by Friday 4 pm at the latest). Whilst we offer priority deliveries such as pre-12pm for example, our timed deliveries are never guaranteed due to possible unforeseen circumstances such as long delays in traffic for the delivery driver which out of ours and couriers control. If you have paid for a non-standard timed delivery and the courier has not been able to deliver within this time please contact us and we will make sure the additional payment you made for the timed delivery is refunded to you. 2-3 Working Day Delivery for all orders placed by 4pm. Orders under £100.00 have an £10.74 (inc vat) £8.95 (ex vat) delivery charge. Orders under £100.00 have a £5.94 (inc vat) £4.95 (ex vat) delivery charge. Orders under £200.00 have a £23.95 delivery charge. Orders under £200.00 have a £4.95 delivery charge. We currently don't offer a delivery service to Europe. 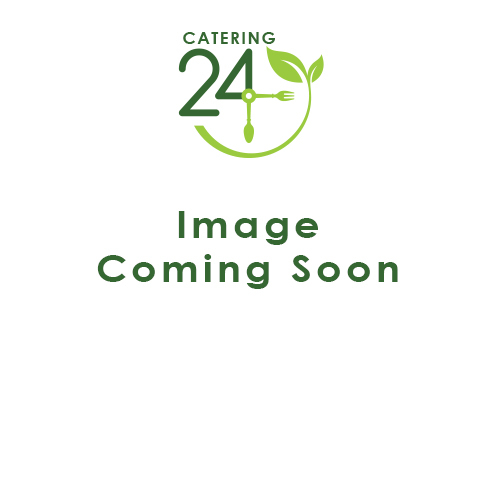 If you would like to make a return of a product please contact us by email at customerservices@catering24.co.uk. Please provide your order number, the product you would like to return & reason for the return. Please note that we will not refund any collection fees for unwanted items. We will only refund products returned within 14 days that are in a resaleable condition. Some unwanted Items also have a restocking fee of £15.00 or 15% whichever is greater. This is payable upon return application being accepted. Goods that are missing or incorrect from delivery must be reported to Catering24 in writing within 7 days from delivery. When the items are received into our warehouse they will be checked whether they are incorrect. Once approved you will then be refunded for the collection fee and incorrect product only if in a resalable condition. If not in a resalable condition you will be charged for the incorrect product. If approved that the product that was sent was incorrect we will then send out the correct product. Goods that are damaged due to delivery must be reported to Catering24 within 24 hours with a photo of the damaged product and packaging. When the items are received into our warehouse they will be checked for damage. Once approved you will then be refunded for the collection fee and sent a replacement. Faulty items sent back to us will undergo a manufacture inspection. It may also be necessary to send the item away to the manufacturer to confirm the fault. Once we have received your item back we will inform you how we need to proceed. Please note: items over 14 days old will not be able to be replaced or refunded. Can I return the goods to you myself? Yes, you can return items at your own postage cost, however, we do recommend you take advantage of our collection service. If returning faulty or incorrect items we will cover up to a maximum postage cost of £9.00 + vat once the goods have been confirmed as faulty or incorrect we will reimburse your postage cost. If you are returning goods which are an order error or an unwanted item the return cost will not be refunded. Please note that if you choose to use your own postage service that it must be a recorded service and any breakages by your courier will be the customers' responsibility. If you would like to return using your own postage service please process your return as instructed above and we will provide you with a returns slip & returns address. If you would like to use our collection service with a reliable courier. The cost of returning a parcel is £9.90 + VAT which will be refunded to you upon inspecting the goods if they are being returned as damaged, faulty or incorrect. If they are an order error or unwanted the return cost will not be refunded. Our collection service is to make it as simple for you as possible, no time wasted going to the post office, working out prices for couriers and is collected from your door. Certain Goods cannot be returned for hygiene purposes. Certain Goods such as knives must be returned in adequate postal packaging for health and safety reasons. We have worked hard to bring you an extensive range of products at competitive prices, providing you a simple and secure platform to place your orders with a fast and reliable delivery service. Found a product cheaper? we aim to beat or price match your current supplier! Gino is our knowledgeable friendly chef who is always happy to help! you can chat to him via our online chat or you can submit a support ticket and a member of staff will respond as soon as possible. Order By 4pm for Next Day Delivery. Premium Brands & Competitive Pricing. ©Copyright 2018 Catering24 Ltd | Company Reg No 09699775 | VAT Reg No 232330847. All Rights Reserved.